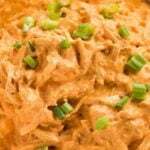 Well, it has been a minute or two since I posted a good old fashioned slow cooker recipe. 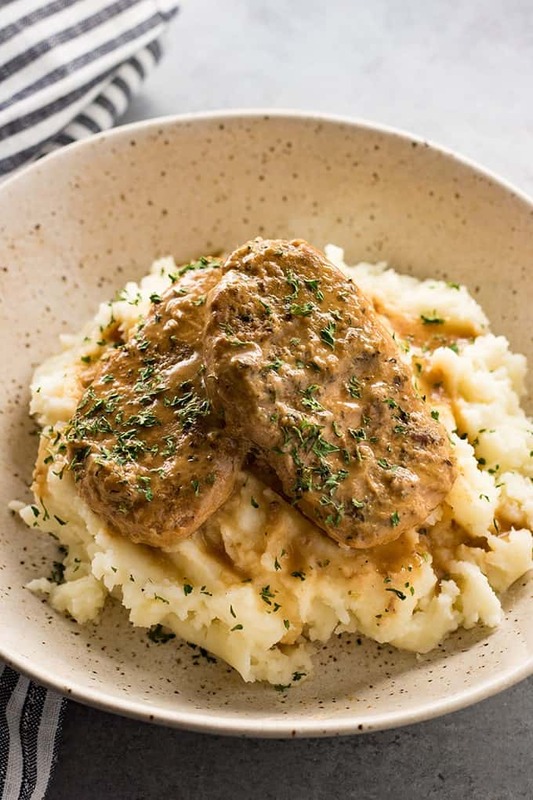 Super tender slow cooker pork chops smothered in gravy is something I grew up on, and something I still can’t get enough of even today. Did you grow up eating pork chops on the regular? Or was your family all about chicken? My mom always mixed it up with a little of both. I still appreciate that we never really ate the same things over and over, and hopefully, my kids feel the same way now! 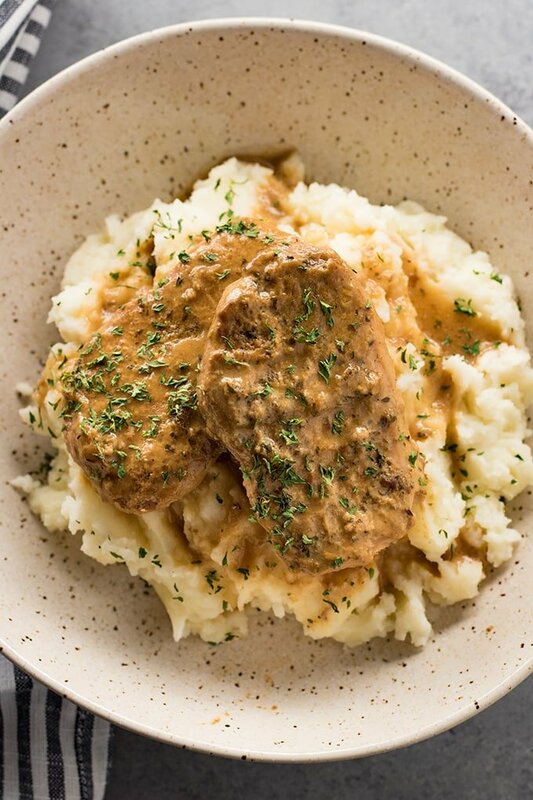 Crock Pot Pork Chops is one of the most requested dinners from everyone in my house. I’m happy to oblige because it doesn’t get much easier than this meal. Plus, it’s just a really great comfort food style dinner. Incredibly satisfying on these cold winter evenings…..and by that, I mean we have a heap of snow on the ground and I’m completely over it! While I do love a good pork chop, I think the gravy is really the shining star here. I could easily eat this creamy gravy with a spoon. It’s just even better that it gets coated over some of the most tender pork chops you will ever eat. 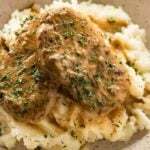 We really enjoy this dish with my homemade Cream Cheese Mashed Potatoes and a big green salad on the side. One of the questions I get asked most frequently is simply how to make pork chops in a crock pot. I think people love pork chops, but aren’t always sure exactly how to cook them so that they stay nice and juicy. For the very best result, the slow cooker is the only way to go in my opinion! You will want to season your pork chops really well. 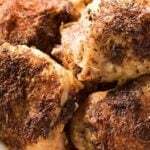 For my recipe, we use ranch seasoning mix, garlic powder, and pepper. I don’t add any extra salt, it isn’t necessary. I’d recommend making as directed without extra salt, then let people salt this dish at the table if that is their preference. This Slow Cooker Pork Chop recipe calls for very minimal ingredients that combine for a truly delicious result. I always have everything like cream of chicken soup, brown gravy mix, ranch seasonings, and beef broth (you can also use chicken broth) on hand. So, this is really a nice “pantry staple” recipe. Thickening the gravy is optional, but, I do recommend it! After your pork chops are finished, you can simply remove them from the slow cooker very carefully. Then, stir together two tablespoons of cornstarch with two tablespoons of water and add it right to the gravy. Turn the crock pot back on high and you should have a nice thick gravy in just about 5-10 minutes. Be sure to check out our video for this recipe below, and follow me on Facebook where we share tons of tasty recipes every day from myself and other awesome food bloggers! Season both sides of the pork chops with the ranch dressing mix, garlic powder, and pepper. 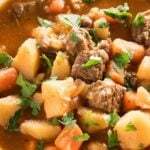 In a large slow cooker whisk together the brown gravy mix, cream of chicken soup, and beef broth. Add the seasoned pork chops to the slow cooker. 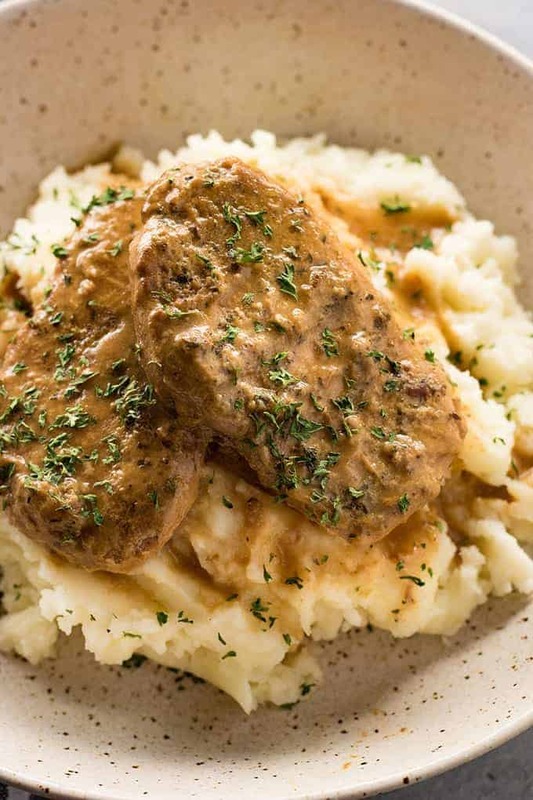 Remove the pork chops carefully from the slow cooker onto a plate. In a small bowl stir together the cornstarch and water. Whisk the cornstarch mixture into the crockpot to thicken the gravy. 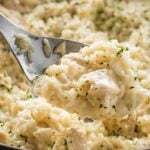 Serve over mashed potatoes or rice and garnish with parsley if desired. I do not have each packet or cream mushroom soup, would it be horrible to make it with ranch dressing instead? I was a little skeptical but the reviews made me want to try this recipe out. I’m so glad I did! It’s so good, budget friendly, and easy to clean up! Thank you! Thank you for this.. I have 5 picky eaters and this recipe is a winner! Finally something I can put into family dinner rotation. 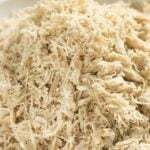 I’m on to try your shredded chicken recipe.. please keep them coming! I love pork and we just got an abundance of pork meat from the butcher. From what I see, it looks like our pork chops are all smoked- could they still be used for this recipe or would that change the cook time? I apologize in advance if this is a silly question, I’m young and still trying to master the glory of the crockpot! Thank you! This was delicious. I had just about all the ingredients. I even made the creamy mashed potatoes. Love love love it all! Your recipe looks delicious, I can’t wait to try this for my family. I immediately went and took my pork out of the deep freezer. One question though, your recipe calls for 1 lb of pork chops and I have 9lbs of bone in chops. So how many times should I increase your recipe for 9 lbs of chops? 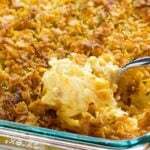 Hi Nichole, I am making this recipe for dinner Sunday 3/27. I have 4 bone in pork chops that total 2 pounds do I need to double the ingredients? I used a little over 3 pounds of bone in pork chops in my 6 quart cooker. They fit fine. I pushed the pork down to keep it submerged. I could have added a little broth but I didn’t. There still was enough gravy. I used a little over 3 pounds of bone in pork chops and it worked fine. I would assume you could triple the ingredients bases on that. There was plenty of gravy. Excellent… easy to make and delectably delicious to eat. I added some sautéed mushrooms and onions to the gravy and it worked very well. Definitely recommend this Recipe. It took me about an hour to prep and cook on the stove top. Well worth the time and effort! This turned out really well. I used boneless chops. Perfect (I might even re-emphasize that no additional salt is needed). Thank you for the great recipe. This is going in the rotation. Made The recipe last night. I loved it and I am sharing it with my Mom. I am not usually a big fan of pork chops but these got so tender and delicious! Thanks for the Great recipe. My little fam loved this! Making this for the second time in a month. We loved this recipe and will continue to make this! 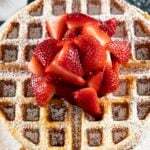 Thank you for sharing, and I loved your post before the recipe! If I add the pork chops while they are frozen, should I increase my cooking time? Hi! Well, lucky you, my life story isn’t included here, so I don’t really know what the issue is? Also, if you’d pay attention, there is a “jump to recipe” button at the very top of my post (every single one) that will take you directly to the recipe! So, you don’t have to read a single dang thing from my post if you don’t want to! Well I enjoyed reading everything you wrote. TY. Thanks for the FREE recipe! It sounds delicious, trying it tonight. Not sure why people complain when they are getting something for FREE. Anyway, thank you for the recipe! WOW…I can’t believe how incredibly RUDE ppl are!! It’s not like anyone FORCED you to read her post!! The gall of some ppl! I want to make this but I don’t have the ranch seasoning on hand could I use onion mix instead? I have a large family. Could I use more pork? Delicious! Used Cream of Mushroom soup.. we loved this recipe! Just put this in the crook. I had to use cream of cheddar cheese soup. I’m out of cream of chicken!! Used ranch & onion mix. Fingers crossed!! Let you know how it came out.